Paytm Money App is a revolutionary app which is going to change the way people in India invest in mutual funds. Paytm Money LTD is a registered investment advisor with SEBI, currently offering only direct plans in mutual funds schemes of 25 leading Mutual Fund Asset Management Companies(AMC’s). Paytm Money allows you to invest in Mutual funds through your mobile without any paperwork. The good news is that currently the app is providing all its services for absolutely free. There are no any hidden charges at all and You can start your investment journey with as low as 100 Rupees per month. 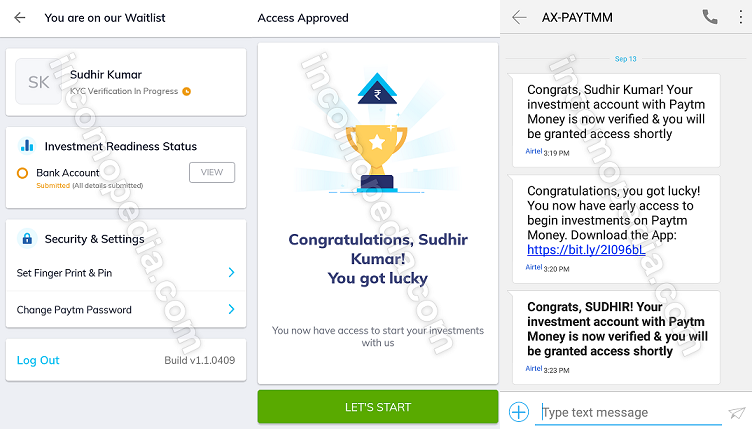 Free Account Opening – There is no any charge for opening an investment account on Paytm Money App. Digital KYC – No need to go anywhere, no need to courier documents, no need to visit any office. You can do it all from home. 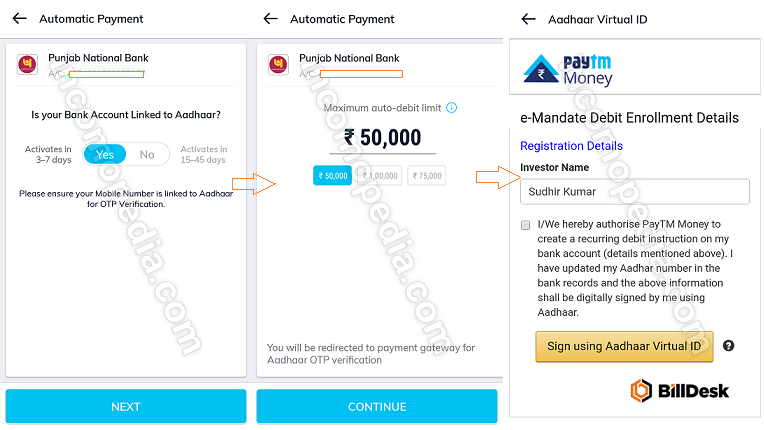 Only PAN, Aadhar and Bank account details are required to sign up. No Any Hidden Charges and Commision on Investment – You heard it right. You can buy and sell mutual funds without paying charges/fee or commision ensuring maximum return on your investment. No any limit on buying/selling. Fully Mobile and Paperless Investing – You verify your account using eKYC, You invest using mobile, You manage your portfolio on mobile. It’s completely paperless. 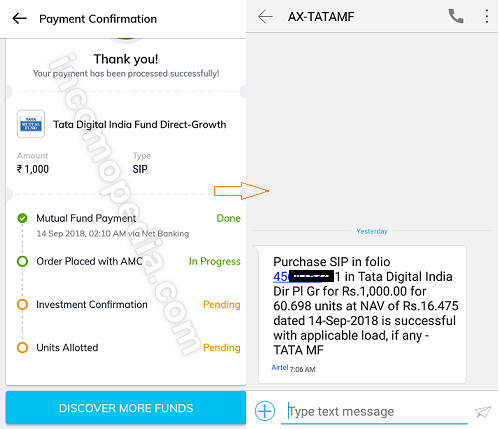 25+ Leading AMC’s – The app is currently offering mutual funds schemes of 25 leading AMC’s and looking forward to add more in near future. The listed 25 AMC’s on Paytm Money cover 90% of the industries Asset Under Management. Finding Mutual Funds is Made Easy – This one is very helpful feature for newbie like me. You can discover and filter Mutual Funds out according to AMC’s, type of mutual funds such as Equity funds or balanced funds, amount of minimum investment, rating by Morningstar, Value Research and CRISIL, Returns and much more. Checking latest NAV, Historical performance, Managers and Holdings of any mutual fund scheme with detailed information make discovery easy. Investment Tracking Made Easy with Simplified Insight – Once you have invested in Mutual Funds, you can access all the details/insight of your investment by clicking on Portfolio option in the app. You can set goals and track your progress. Security Features – 2 Factor Authentication, Fingerprint and Pin protection ensures no one else can access app or your portfolio without your permission. Convenient payment Options – All major payment options such as Net banking, Autopay with eMandate and physical mandate are available. UPI will soon be added. First of all, download Paytm Money App. Open the app. You can Login Using Your Existing Paytm App Login Credentials. Click on Apply for Access. On next screen you will see no. of user ahead of you. Tap on I want faster access. Enter your PAN Number to check if you are investment ready. 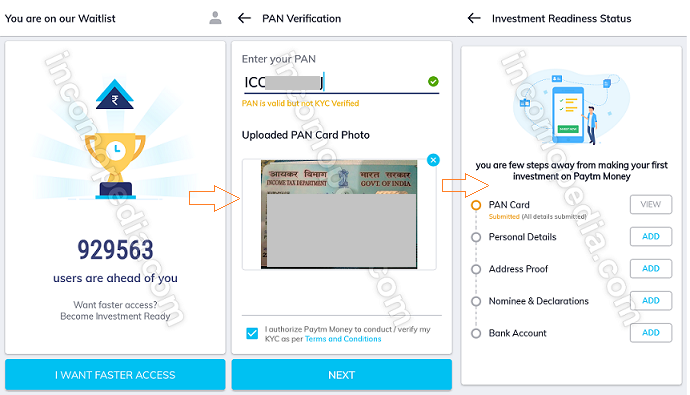 It will ask you to upload PAN Card photo. On the next screen complete personal details. Add address proof. You are required to upload Aadhar front and back photo. Add Nominee and Bank account details. Upload a photo of Cheque and Wait for 3 to 7 days. I don’t know how many users a day they are currently providing access to. Verification might take some time. You will be notified by email/sms once your account is verified. Once your account is verified, you can set up auto pay for automatic deduction of money for your investment(SIP). To set up auto pay, Tap on Profile from the bottom navigation. Tap on Setup Auto Pay. On next screen again tap on Setup auto pay. Select your bank account and tap on Next. If you bank account is linked to aadhar autopay will be activate with in 7 days otherwise it may take up to 45 days. Make sure your mobile number is linked to aadhar for OTP verification. If you are ready, tap on Next. Select Maximum Auto Debit Limit Amount and tap on Continue. Tap on Generate Virtual ID if you don’t have already generated virtual id. You will be redirected to UIDAi website. Enter Aadhar number and other required information to generate virtual 16 digit ID. On next screen you will see eMandate Debit Enrollment Details. Tap on Sign Using Aadhaar Virtual ID. Enter Virtual ID you received in SMS. Finally Enter OTP and Submit. Great your auto pay request has been submitted and it will take some time to be approved by your bank. You will be notified by SMS from your bank once your request is approved or rejected with reason listed. 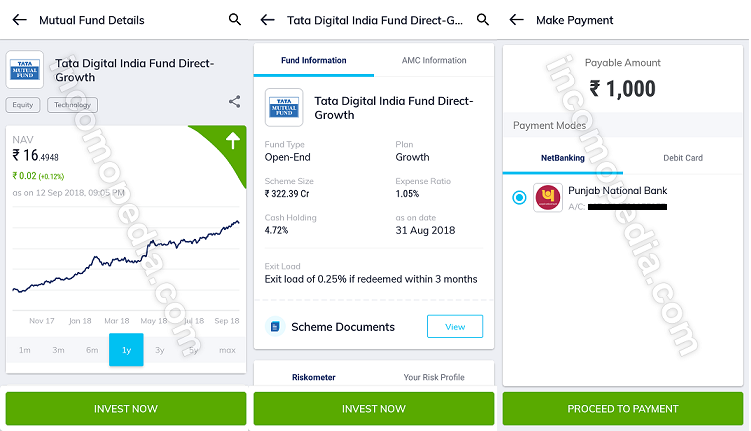 Searching Directly Using Search Box – If you already know which mutual fund scheme is for you then you can directly enter the name of fund or AMC in search box provided at the top and get all the information of the fund such as minimum investment amount, who is managing the fund and historical performance of the fund. Quick search allows you to find schemes by selecting one or more filter options such as fund category, fund type , minimum investment amount, rating companies and no. of rating stars. 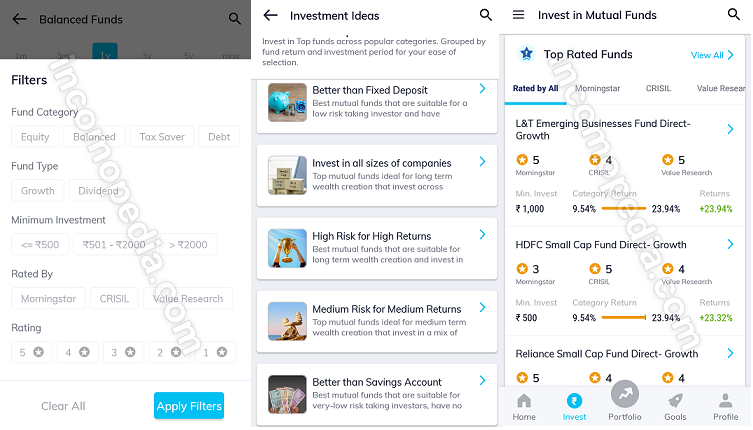 Discovering Funds By Investment Ideas – Tap on any idea and you get some suggestion based upon what idea you have tapped on. For an example if you tap on High Risk , High Return idea, It will suggest funds suitable for long term wealth creation and invest in mid and small companies. Its entirely up to you what you are looking for. Discovering Funds by Top Rating – There are investment research companies which rate different mutual funds. 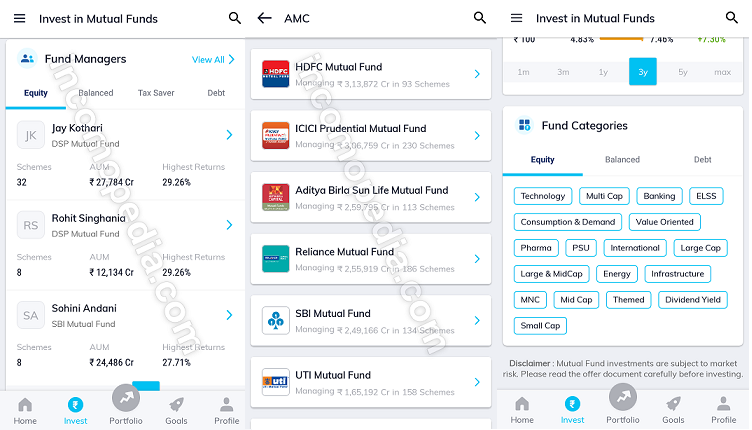 In Paytm app you can sort mutual funds schemes by rating given by 3 popular investment research companies MorningStar, CRISIL and Value Research. You can also arrange funds by overall rating of all 3 research companies. Discovering Funds by Fund Managers – There must be someone or a team who will be responsible for managing your investments so it becomes important to know the reputation, history, qualifications etc of the fund manager. Tap on any fund manager name under different fund categories such as balanced, equity etc and you will redirected to fund manager profile where you can see list of funds managed by Him and other stuff like background of fund manager. Discovering Funds by AMC’s – There are 25+ Asset Management companies listed on Paytm Money app. Tap on the name of any AMC like HDFC mutual funds or ICICI prudential mutual funds and you can check all the schemes offered by a particular AMC in various categories and Funds Under Management etc. Discovering Funds by Fund Categories – There are 3 major categories of funds on Paytm Money App – Equity, balanced and Debt. If you tap on equity and then click on technology, you see a list of schemes that invest at least 80% of its net asset in equity or equity related instruments of the companies in technology sector in india. Hope you have got an idea what this feature does. 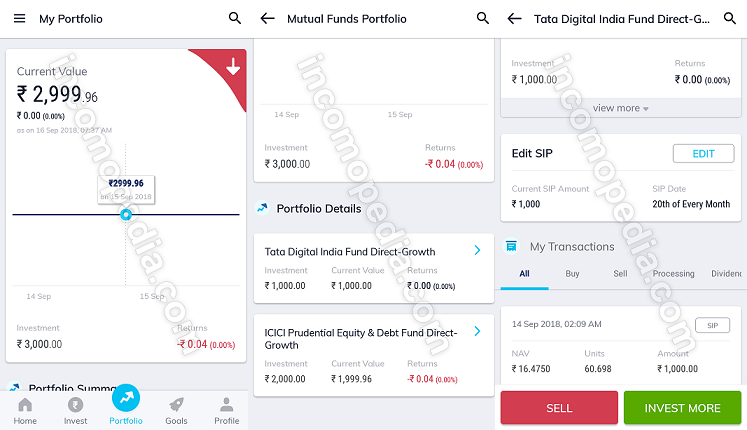 Once you have selected a fund you want to invest in, tap on the fund name and on the next screen, You can check the NAV, category, ratings, historical performance, fund managers, Fund Type, Plan, Expense ratio, scheme size, Scheme holding summery, cash holding, exit load and other details of the fund. Like they say in every advertisement, your investments are subject to market risk, please check the documents of the carefully before you invest. It is advised to learn all these terms before you make a final decision. Once you have checked all the details and document of the scheme carefully and are sure to invest in the scheme, tap on Invest Now. Select Investment Mode Preference i.e SIP or Lumpsum. Fill in Investment Amount and Day of the investment if you are selecting SIP as investment mode otherwise fill in one time investment amount if you are selecting lump sum. Select Payment Mode and click on Proceed to Payment. That’s it. You have completed your part. The order is not processed instantly. It takes 2 to 3 business days for the mutual fund company to confirm investment, depending upon the scheme. You get a email/SMS once investment is confirmed by mutual fund company with details like Folio Number, units allotted to you and price(NAV) of the unit. It takes little more time until you can see your investment in your portfolio. Paytm Money will send you notification once investment is successfully processed. You will also get email from paytm for the same. Once your investment is successfully processed, you can tap on Portfolio option in bottom navigation of the app and can see all the schemes you have invested in and current value of the investment. You can select an investment and make changes in SIP or sell your units anytime or invest more in the scheme. I am using the app since its inception and I want to tell you that the app is not working the way it should be. Support is worst. They hardly respond to any message. There is no customer care number you can talk to someone in authority. If you try to raise your voice on twitter, you always get same reply. The NAV are updated by AMC’s around 9PM but Paytm Money sometime don’t even update on next day. That’s it. Make sure your bank account never run out of money on the payment date of SIP. Mutual Funds Schemes are subject to market risks. Make all your decision wisely. Share the post if you find it useful.